Walter E. Lotz Jr., a retired Army Lieutenant General and former Treasury Department Assistant Secretary who held a doctorate in physics and who had been an Episcopal Church lay minister since 1990, died of myelodysplastic anemia July 10, 2000 at the health center of the Falcons Landing retirement community in Sterling. General Lotz, a Pennsylvania native, was a 1938 graduate of the U.S. Military Academy at West Point. He received a master's degree in communications engineering from the University of Illinois and a doctorate in physics from the University of Virginia. He also was a graduate of the Industrial College of the Armed Forces. As a signal officer, he went to Iceland in the early 1940s and served with the Army Air Forces in Europe during World War II. In the 1950s, he served in the office of the Army's chief signal officer in the Pentagon and as signal officer of the Eighth Army in South Korea. Later assignments included a tour as Deputy Commanding General of the Army Electronics Command at Fort Monmouth, N.J., and service as director of Army research. In 1965, he went to Vietnam as chief of communications under Army General William Westmoreland. He also served as assistant Army Chief of Staff for Communications Electronics. His last assignment, before he retired from active duty in 1974 was with the North Atlantic Treaty Organization in Europe, as head of the NATO Integrated Communications Systems Agency. 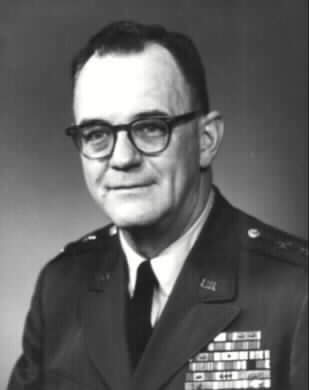 From 1975 to 1978, General Lotz worked for the Pentagon as a civilian, serving as the Defense Department's assistant director of research and development. In 1979, he served as assistant secretary of the Treasury for advanced technology. After that, he did consulting work and was a pro bono adviser to the radio engineering committee of Voice of America. His military decorations included two Distinguished Service Cross medals, four awards of the Legion of Merit, the Bronze Star, two Air Medals, two Army Commendation Medals and the Defense Civilian Service Medal. He was a life fellow of the Institute of Electrical and Electronics Engineers and an award-winning fellow of the Radio Club of America. He also was a member of Sigma Xi and Tau Beta Pi. A former Arlington and Alexandria resident, General Lotz moved from Northern Virginia to Florida in 1989 and then to Sterling in 1996. Survivors include his wife of 60 years, Shirley Colton Lotz of Falcons Landing in Sterling; three children, Shirley Virginia Lotz of Annandale, Roger Colton Lotz of Lihue, Hawaii, and Anne Lotz Heins of Honolulu; 10 grandchildren; and five great-grandchildren. 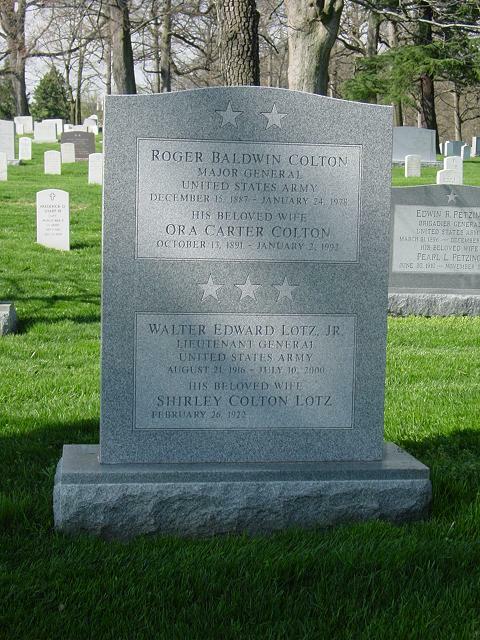 NOTE: General Lotz is buried in the same gravesite in Section 30 as his brother-in-law, Roger Baldwin Colton, Major General United States Army. Lieutenant General Walter E. Lotz Jr.
Walter E. Lotz Jr., Lieutenant General (Retired), 83, of Falcons Landing, Virginia, died July 10, 2000. A memorial service was scheduled for 11 a.m. Tuesday, August 1 at Fort Myer Chapel in Arlington, with Chaplain Lieutenant Colonel David L. Stricker and the Rev. Dr. Samuel C. Walker officiating. Interment will follow at Arlington National Cemetery, with military honors. Survivors include his wife, Shirley Colton Lotz of Falcons Landing, Sterling, Virginia; three children, Shirley Virginia Lotz of Annandale, Roger Colton Lotz of Lihue, Hawaii, and Anne Lotz Heins of Honolulu; ten grandchildren; and four great-granddaughters. The family has established the Walter E. Lotz Jr. Memorial Fund for the Johnson HC. In lieu of flowers, donations may be made to the Falcons Landing Benevolent Fund. Arrangements were by Loudoun Funeral Chapel in Leesburg. Of Falcons Landing, Virginia, on Monday, July 10, 2000. Survivors include his wife, Shirley Colton Lotz, of Falcons Landing Sterling, Virginia; three children, Shirley Virginia Lotz, of Annandale, Virginia, Roger Colton Lotz, of Lihue, Hawaii and Anne Lotz Heins, of Honolulu, Hawaii; ten grandchildren and four great granddaughters. A memorial service will be held on Tuesday, August 1, 2000, 11 a.m., at Fort Myer Chapel, Arlington, Virginia, with Chaplain (Lieutenant Colonel) David L. Stricker, and the Rev. Dr. Samuel C. Walker, officiating. Interment will follow at Arlington National Cemetery with full honors. The family has established a Walter E. Lotz Jr., memorial fund for the Johnson HC. In lieu of flowers, donations may be made to the Falcons Landing Benevolent Fund in memory of his ministry, 20522 Falcons Landing Circle, Potomac Falls, VA, 20165-7595.